This 'lite' version of equinux's popular eBay tool iSale 5 is great for managing your listings. After creating and submitting your auction page with iSale express, which is much easier than using the facilities on the eBay site, you can organise your sales via user-definable and smart groups. Running, ending-soon and completed auctions are grouped, and if an item doesn't sell you can keep the auction and relist it later. You can review what your listing looks like on the eBay site both before and after it goes live, and running auctions are badged with the current sale price. It's also great for building auctions and uploading them to eBay at a later date. Unfortunately, iSale express is less useful when preparing auctions. It feels too much like a cut-down demo of iSale 5 rather than an entry-level version of the application. You're constantly shown things you can't use, you're restricted to three templates (but more are promised in a future update), and there's no means of automatically adding a description and images, something you can do on the eBay site, even in Quick Sale mode. 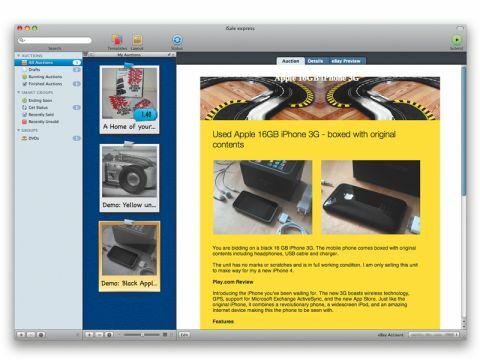 Our advice is to go straight for the excellent iSale 5; it has over 200 templates and a host of features, including a Research Assistant to find pictures, item descriptions and web hosting to avoid eBay's picture fees.